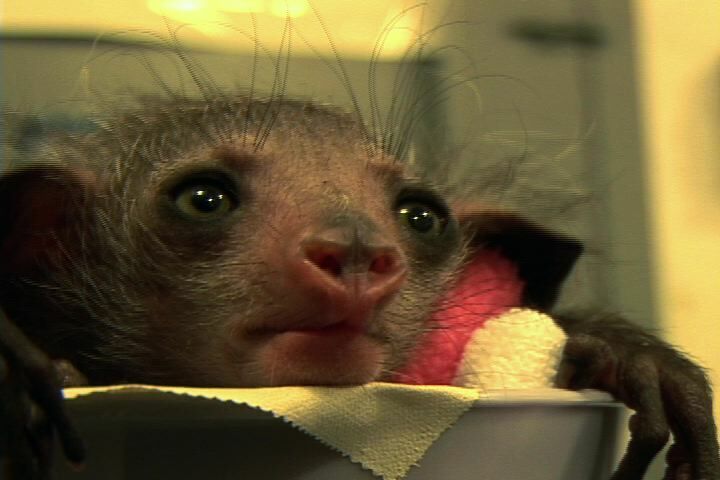 Ichabod the baby Aye-Aye was the somewhat nervous 2008 result of a painstaking 2-year effort to teach his sire how to make babies. A BBC Television production called “Miracle Babies” is airing this week on the Nat Geo Wild cable channel, with two segments about the captive breeding programs at the Duke Lemur Center. Their crew travelled all over learning about captive and not-so-captive breeding programs – all of which seem to result in adorable infants, strangely enough! Then on Wednesday Sept. 14 at a more reasonable 8 p.m., they check in again with a segment about the stunning Coquerel’s sifakas and their spindly little infants. View the complete schedule. Coincidentally, the Lemur Center posted a baby video of its own over the weekend, starring an impossibly small baby mouse lemur and its mum.